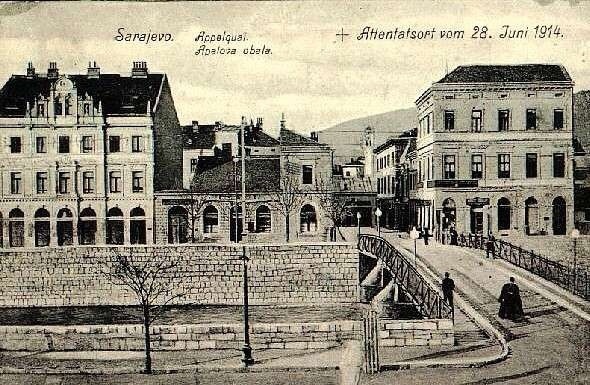 Last month I stood on a Sarajevo corner and tried to imagine the day 100 years ago when, on that very spot, an event changed the history of Europe and the whole world for the upcoming century. Today this corner looks very much like it did 100 years ago. In May I stayed in a great little hotel (Old Town Hotel) that was just at the end of this historic little street. That’s it. Nothing mentioned that within a month after this shooting, all of Europe was drawn into the war that became World War I, a global conflagration that apparently claimed over 16 million lives and wounded another 20 million — staggering statistics that have ranked this as one of the most deadly conflicts in human history. Earlier that spring, while Austrian Archduke Ferdinand planned his trip to Sarajevo, proud to have his pregnant, commoner wife, Sophie accompany him, a group of Serbs who were disgruntled with the Austrian control over their region plotted to assassinate him. Knowing that Ferdinand would be exposed in his motorcade through Sarajevo streets and inflamed by recent Austrian military activity in Bosnia, the seven Black Hand conspirators hatched their plan. They smuggled weapons, guns and grenades, into Sarajevo and seven of them traveled individually into Bosnia from Belgrade. Their plan would position them at several spots along the motor route to the town hall. Each would have a chance to kill the Archduke and all had vials of cyanide to kill themselves afterward if captured. It was a bright sunny Sunday morning and crowds lined the streets to greet the Archduke and his wife, both decked out in regal finery and waving from the raised seat of their open car. 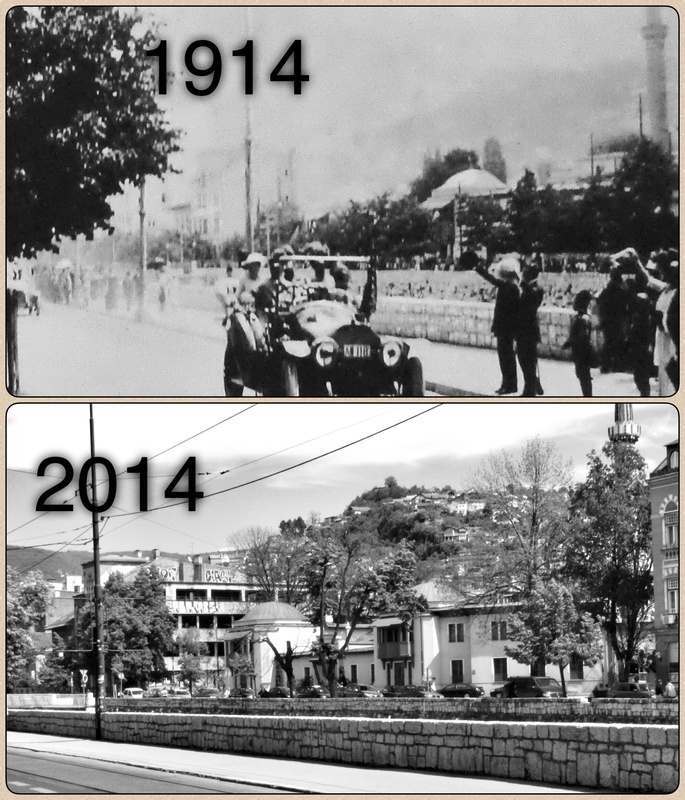 Part way along the street that ran beside the river, Nedeljko Cabrinovic threw a grenade at the royal vehicle. It bounced and rolled under the Archduke’s the car and toward the car behind. It had a ten second delay on the fuse so when it exploded it damaged the vehicle that was behind Ferdinand’s, injuring the occupants. Ferdinand’s car sped up and proceeded to the city hall. After the official function was done, local officials persuaded Ferdinand to make a speedy exit from the city due to the obvious danger to him and Sophie. Ferdinand agreed but first wanted to go to the hospital to check on the members of his entourage that had been injured earlier in the day. They got back into their car and set off down the street. Here is how the story goes from there. The driver is uncertain of the new route and makes a turn up a small street, not far from the city hall. The local governor, also in the car, shouts to the driver that he has taken a wrong turn off Apple Quay. The driver stops the car and tries to reverse onto the main thoroughfare. The car stalls. Nineteen year-old Gavrilo Princip, one of the Black Hand seven, thinking that chances to carry out the assassination had passed has stopped for a something to eat at Moritz Schiller’s Shop near the corner of Franz Joseph Street and the main Appel Quay. He looks up to see Ferdinand and Sophie perched in the stalled car only a few feet from him. From his waistcoat he pulls his revolver and fires two shots, almost at point blank range. One hits Sophie and the second hits Ferdinand in the neck. Both stump forward, utter a few words to each other and die shortly thereafter. 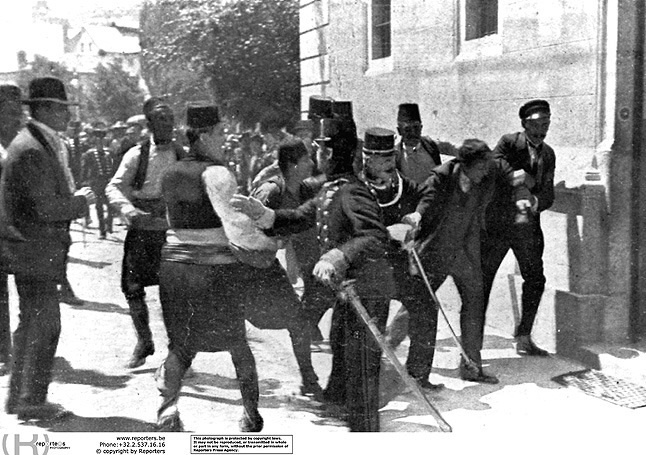 Gavrilo Princip is arrested shortly after shooting Ferdinand and Sophie in Sarajevo on June 28, 1914. Princip and Cabrinovic both took their cyanide but if was outdated and only made them vomit. Cabrinović also jumped into the river but it was only a few inches deep. Princip was quickly apprehended. Both were convicted and died in prison of tuberculosis before 1918. For its day, this was a terrorist event that equates in political significance with the 9-11 attack in New York. It is deemed to be the spark that ignited wars that involved Europe and the globe for the 20th century and beyond. June 28 also happens to also be the date of the famous Battle of Kosovo in 1389 — one that was often mentioned by Slobodan Milosović in partial motivation for the conflict in Kosovo at the end of the century. When I was a young student this assassination was the only thing that I knew about Sarajevo. I also knew that my grandfather went to war in Europe as an indirect consequence of this event. It always surprises me when I walk past this Sarajevo corner, how little official notice has been given to mark the spot where this world-altering event happened. But the fact that so much about that fateful corner is unchanged, allows one to stop and just imagine how it unfolded and reflect on the consequences of the place where you are standing. A more striking remembrance than a huge cenotaph, perhaps. Just like actors learn lines and rehearse to eventually share their creativity with others, writers write both to stimulate themselves but also to share their thoughts with readers. Remarkably, since starting my blog about two years ago, there have been 15,000 views. 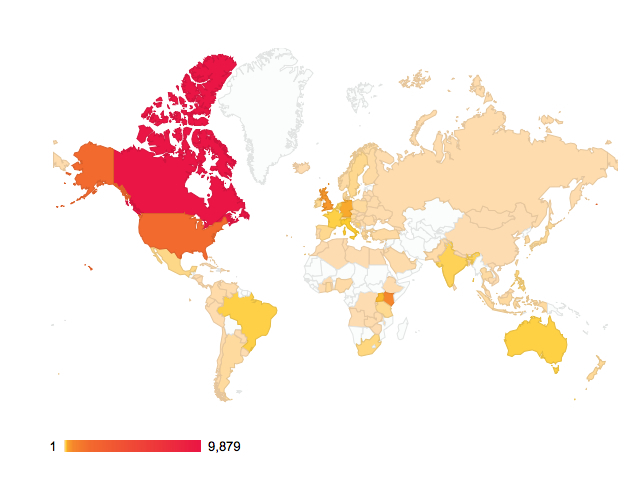 This isn’t 15,000 people but 15,000 pages read over that time – and in 114 countries. Thanks to everyone who has taken interest in what I write. I hope you have been both amused and also learned some new tidbit along the way perhaps about the places that I have visited, people I have met or about the charity that consumes a lot of my energy – the CanAssist African Relief Trust. Your comments are always welcome. Do keep them coming! Stick with me. Lots more to come.